Returning from an overseas vacation, I peeked from the airplane window. We were somewhere above one of the mountain states. The sun was setting, and I saw amber and red mountain ridges with long blue shadows, the highest points already dusted with snow. It was a beautiful idyllic view, unfortunately with a sinister and surreal twist; this tranquil mountain scape was pock-marked like with smallpox. 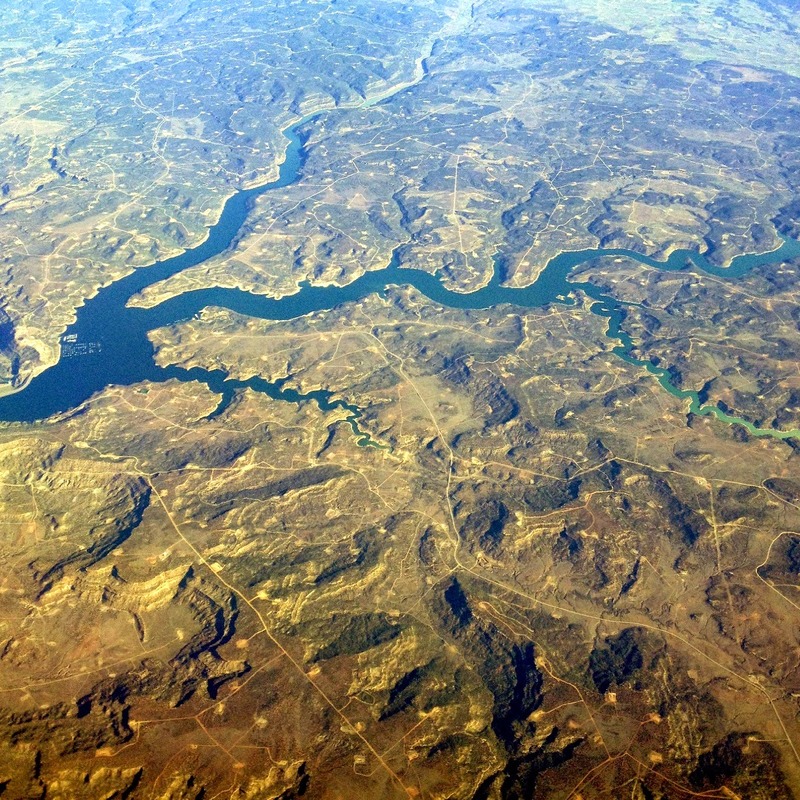 I saw something like it before, in spring 2012, in better light and having a better seat, I took a picture - the landscape around Navajo Lake. This is a wounded landscape. The lake itself destroyed most holy places of Navajo people (just consider the arrogance in calling the project Navajo Lake!). And the smallpox marks are fracking platforms hardly half-a-mile apart. And just like smallpox, fracking platforms are only surface blisters and scars, but the real disease lurks underneath. It is known that fracking wells occasionally leak poisons into aquifers. Among hundreds and hundreds of boreholes, a single one can pollute underground water (in the west - fossil water, nonrenewable, finite resource) for miles and miles in broad circles and often forever. Our societal carbon addiction certainly looks and feels like serious malady. I am so happy that our Rutgers church is taking these matters seriously. Our Trustees in their October meeting committed our church to conduct a full energy audit of our buildings. And the Session and Trustees continue discussion about the best and honest ways to divest from the fossil fuel industry. For us as religious people all our concerns, hopes and aspirations are rooted in our faith, our worship, theology and spirituality. This Sunday worship brings us seasonally appropriate message of Festival of Wine Harvest. Prophetic as well as Jesus’ vision of the vineyard will judge, inspire and encourage us to live justly among ourselves, in our society, with our environment, and in peace with our planet. Come this Sunday to celebrate Dionysia of social and ecojustice. A new fragment of the Manhattan Gospel of Henry Rutgers discovered! Although in this case it is almost certainly an example of Ancient Upper West Side Forgery - someone took a piece of old papyrus and wrote on it a well-known parable in contemporary dialect. Its historic value is therefor doubtful, but the cultural approximation is nevertheless interesting. 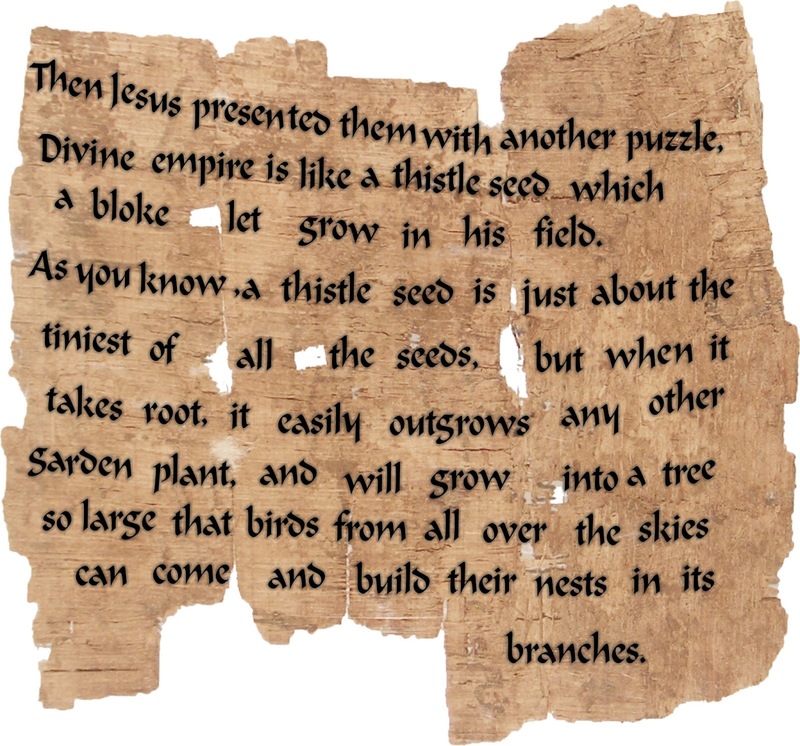 The anonymous author of this forgery clearly understood that the mustard plant in the original Galilean setting was equivalent to thistles and nettles of our more northerly latitudes and as such they were indication of fields allowed to go bad. Fields overgrown with weeds were most likely repossessed farmland kept by distant landlords for speculation. Thus we should be thankful to this Ancient Upper West Side forger, because he attempted to preserve the original meaning of the parable. You (Galilean audience of family farmers) might be forced and expelled from your land and it is left to weeds by distant landlords and speculators, but take heart! You are just like those weeds, tenacious, with enormous vitality, future belongs to you! These are two pictures of bovine statues. One statue measures 16 feet, the other just few inches. Both statues are made of bronze, one weighs 71 thousand pounds, the other just several ounces. One is just 27 years old, the other at least 32 centuries. Both are now located in NYC, one at the “temple” of speculation, the other at the palace of education (Metropolitan Museum). One statue is vicious, aggressive and in our face, while the other is quite docile and almost cuddly. One is quasi-religious object depicting individualistic worship of speculative profit, the other was a part of collective and complex worship in an agrarian society. One statue represents an impersonal system exploiting countless millions around the world, while the other was part of a religion in a small city state where any potential abuse was personal and thus limited by close proximity and small numbers. As far as the bovine statuary and iconography goes, I have never seen among the ancient artefacts (Egyptian, Sumerian, Babylonian, Syrian, Greek and even among famous Cretan bulls) anything which would get close to vicious aggression of the Wall Street charging bull. I don’t think it is mere coincidence, I think it is an accurate symbolic representation of what any given society worships. This Sunday we will read the story of the Golden Calf. It is a marvelous opportunity to explore complex borderlines of idolatry, what we worship and what really matters in our lives. painted between 1297-1300 and tradionally attributed to Giotto di Bondone. Do you know that the Earth has its own voice? Recently I listened to a lecture by geophysicist Michael Wysession and he mentioned this very fact. When the Earth is stricken by a big earthquake, the entire planet reverberates and resonates even for months and months. The lowest sustained global frequency has a wavelength 54 minutes long. That corresponds to the surface going up for 27 minutes and then coming down for same period of time. We cannot register this with our senses; it was discovered only with the help of modern instruments. Although there is no way we can hear it, this harmonic movement represents the Earth’s fundamental tone - it is a note E twenty octaves below the middle E. The entire Earth behaves like a giant bell or an enormous singing bowl. 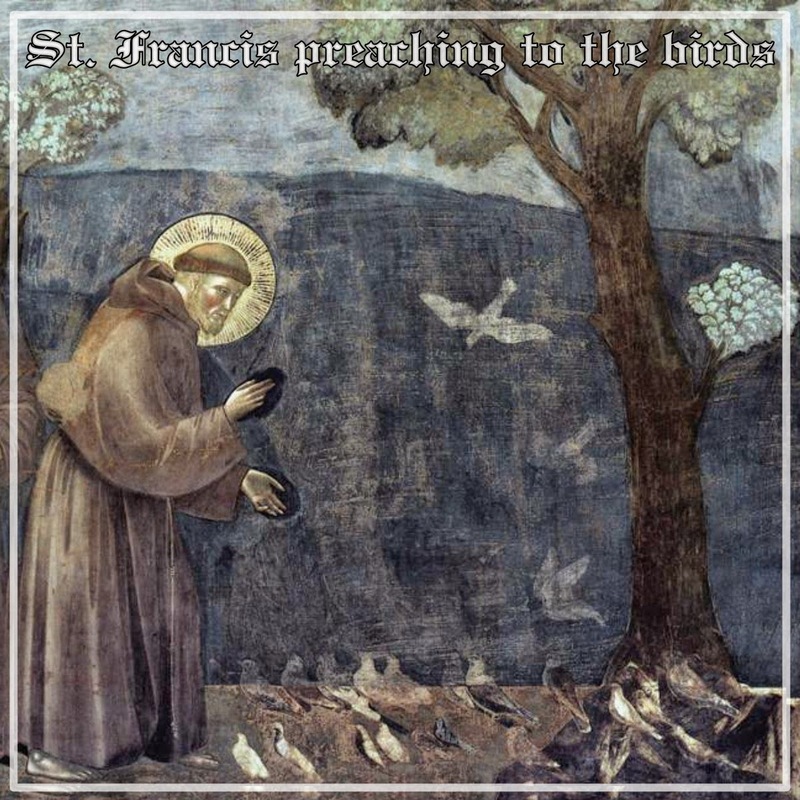 You see, St. Francis was right after all when he spoke about our Sister Earth singing and praising the Lord. I always thought it was mere poetic hyperbole. Now I know that in the cosmic chorus celebrating our Creator, our sister Earth sings Basso Profondo, Profondissimo! As we celebrate World Communion Sunday and St. Francis Day, we will join not only a marvelous and surprising chorus of peoples, nationalities and races but also our sisters and brothers - creatures and plants, stars and planets. It is a magnificent cosmic choir with a fairytale-like voice-span and we all are invited to lift our voices and sing.